Vermont Tree Goods of Bristol has donated a massive slice from an American elm tree to Cathedral Square Corporation to hang in the lobby of Elm Place, an affordable living community in Milton for seniors and individuals with special needs scheduled to open its doors in March. The slice comes from a storied tree in Richmond that succumbed to disease and was removed by the town in 2014. 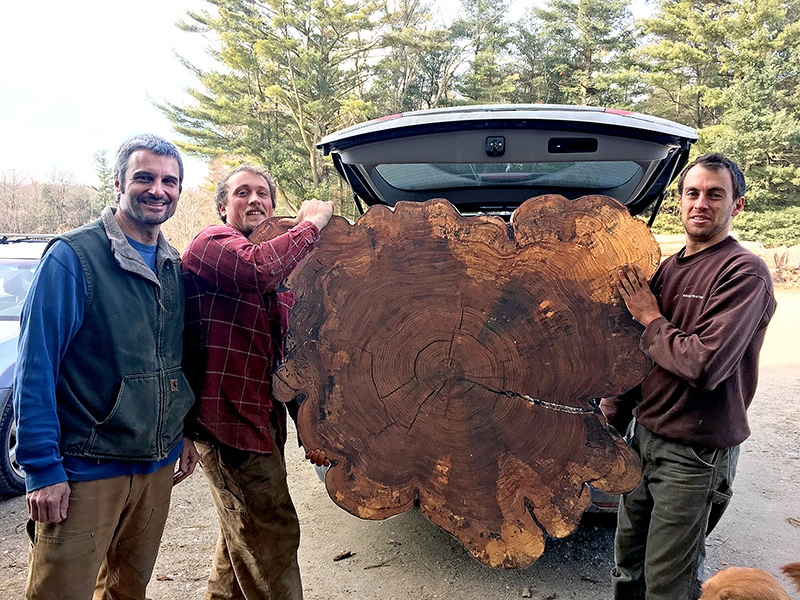 Town officials saved a 10-foot piece of the 50-inch-diameter trunk and invited proposals for using it to create something memorable for the town. VTG was the successful bidder and created two tables for the Richmond town hall. It has used the remainder to create other pieces of furniture — and now the thick slice it has donated for Cathedral Square’s newest development, Elm Place. Elm Place, offering 30 one-bedroom apartments, is the first multifamily home in Vermont built to passive-house standards — standards for comfort and energy efficiency that far exceed those required by building codes. The residence features fully accessible kitchens and bathrooms and, like all Cathedral Square properties, 24-hour maintenance and free access to SASH® (Support and Services at Home), an award-winning wellness and care-coordination program for seniors created by Cathedral Square. Vermont Tree Goods builds high-quality furniture and wood products from recycled Vermont heirloom hardwoods, featuring the “live-edge” lines of the trees from which they come. Its mission includes strengthening the local economy, protecting forests and reducing Vermonters’ carbon footprint. Cathedral Square Corporation, a nonprofit organization founded in Burlington in 1977, is Vermont’s a leader in the development of affordable, service-enriched housing communities for seniors and individuals with special needs. CSC owns and/or manages 30 senior housing communities in Vermont and administers the SASH program statewide as part of Vermont’s Blueprint for Health.